Mother Goose is on the nest and Father stays close by in the water. Now we wait. We already have five other couples paddling around the lake showing off their broods and our gal is just getting started. Maybe as she sits there day after day for the next four weeks, watching all those youngsters growing bigger and stronger, she’ll wish she hadn’t put this off for so long. Some geese just cannot make up their minds. You’d think that Father Goose himself laid those eggs and was sitting on that thin nest with nothing but a few twigs and his wife’s breast feathers between him and that rocky ledge. His nerves are already on edge. While I was watching yesterday from a few feet away a couple and their four goslings were out for a swim at the far end of the lake. The gander raised his head, shook it in the air, and released a loud series of gobbles aimed in our general direction. Whereupon Father Goose yelled back with agitated gusto, looking for all the world as if he were sick and tired of that braggart carrying on about his brilliant little fuzz-ball children. He then extended his neck an inch above the water, opened his beak, and rushed muttering to his mate as though he had just taken care of that bore once and for all and she could rest easy with him on the job. Something tells me that we’ll have to send Father to anger management or slip him some Xanax before he gets these four eggs hatched. REMINDERS: Don’t forget to vote for your choice of 2010 Hall of Fame Poets this week. The ballot boxes close Thursday night at 10:00 CST. Early leaders are Euleta Usrey (adult) and Taylor McGowan (young poet). You can also see my W.O.M. poems and let me know if you have a preference among them. Thanks to all. Back today for an invited encore is none other than Father Goose, sometimes known as Charles Ghigna. To see Charles’s original appearance as my guest on May 7, 2010, here’s the link. Hi, Charles. It’s good to hear from you again. What’s up with you these days? By davidlharrison  Posted in Charles Ghigna, Father Goose, Featured Guest, What Are the Pros Up To?  Tagged Charles Ghigna, Father Goose, Featured Guest, What Are the Pros Up Tp? My guest today is Charles Ghigna (pronounced geen-ya). What you are about to read is part of an interview that originally appeared in Inkwell Newswatch in January 2008 and excerpted here by permission of Mr. Ghigna. IN: You have been professionally writing for 30 odd years and became known as Father Goose back in the early days of your career. Legend has it students and teachers picked that name. Why did your audience choose that name for you at that time? Why did it stick? CG: The “Father Goose” moniker caught on for several reasons. When I first started reading my poems at schools and libraries, teachers and librarians enjoyed calling me Father Goose because of the obvious association to Mother Goose. Children started calling me Father Goose because it is fun to say and a lot easier to spell than Ghigna. My publishers liked the idea of a Father Goose because it gave them an image to promote. The first image of Father Goose appeared in 1994 on the cover of Tickle Day: Poems from Father Goose, one of my first books of poetry for children. Father Goose also appears a few times inside that book and others. Children tell me they like trying to find him in the different scenes. In one scene Father Goose is standing on top of a turtle! One of my latest books, Animal Tracks: Wild Poems to Read Aloud also has a goose on the cover, as well as geese inside. When I am asked to autograph books, I often draw a little Father Goose hat on the goose that appears on the title page. IN: Among other impressive accomplishments, your books have been exceptionally successful and your first book contract was with Walt Disney Company’s Hyperion Books back in 1992. What advice can you give to budding authors of children’s literature about dealing with large corporate American publishers? CG: I do not think about “corporate America” when I write. That might be good advice for others too. I simply climb the steps to my attic office each morning hoping the magic will happen once again, and I will find another gem of an idea that I can turn into a worthy poem for young minds, hearts, and imaginations to enjoy. I like to think of my agent, my editors, publishers, illustrators, marketing, publicity, and sales people as one big team whose job it is to get good books into the hands of as many children as possible. I am fortunate to have such great teammates! IN: Your great grandfather was a full-blooded American Indian and we’re wondering whether this indigenous heritage seeps into your writing at all? CG: I would imagine that every author’s heritage seeps into their writing whether we are aware of it or not. We are, I believe, a composite of our heritage and of our experiences. Who we are comes through in our writing more clearly than the echo of our voice, more distinctly than our photo or our fingerprint. I am very proud to be descended from Native Americans, as well as from Italians, Irish, Germans, and French-Canadians! IN: Who have been the most influential people during your writing career and why? CG: Though neither of my parents were scholars or writers, they set the tone and direction of my life. My father taught me a strong work ethic, and my mother always made me feel that I could do anything I set my mind to doing. She was the most creative person I have ever known. Many great poets and authors influenced my early attempts at writing including Robert Frost, Carl Sandburg, Edna St.Vincent Millay, Sara Teasdale, Ogden Nash, John Updike, and James Dickey. IN: What approaches or methods do you use when writing? CG: I usually have more ideas going on than I have time to write. I work fast and quick letting the idea take me where it wants to go. I try to trust my instincts and enter the creative writing process with a sense of wonder and discovery. If the idea generates enough heat and excitement for me I keep going. If not, I move on to the next idea. My best efforts come when I discover something new on the page or screen that I didn’t know I knew until I let myself go. I try to write with as much passion as I can muster. I write with total abandonment. That’s when the good stuff comes. If I’m lucky I will find a little surprise or two. That’s the kind of writing I like to do. It’s also the kind of writing I like to read. I used to tell my students that each one of them already has poems and stories inside them. All I can do as a teacher is show you ways of letting them out, of giving you a few inspiring tips and strategies, then get out of the way and let the magic happen. Writing creatively is so much different than writing expositorily. Outlines might be good in writing an article or essay, but they often limit the poem or story from going where it wants to go. Imaginative writing should generate passion and excitement for the writer, as well as the reader. IN: You have your own, personal site at http://www.fathergoose.com. How important is it for writers to have a website? CG: I like to think of the Father Goose website as a celebration of children’s literature and as a resource for students, teachers, librarians, and writers. They can go there to get inspired and to find different ways of approaching the writing process. They can also learn all about Father Goose and how he became a lover of language and writing. I used to spend endless hours answering mail from students and teachers. Most of the questions were the same. I decided it would be fun to put up a website that might save me, and them, lots of time, time we all could use to write more poems and stories! IN: When reading to children in large groups, such as at libraries and schools, how do you handle situations when the children are blunt and point out that they don’t like your work? CG: Yes, kids are very honest! I love that. I have been doing school visits for more than 30 years now and so far no one has ever said they do not like my work. Sometimes when I am working on a new book of poems, I will read the poems aloud to the children and ask them to help me pick out which ones they like the best. I asked one group of children at a bookstore reading to help me title a new book I was working on at the time. I already had two titles that I liked, but wanted to know which title they liked better. One title was Autumn In The Pumpkin Patch. The other title was Oh My, Pumpkin Pie! The majority of them choose the pie! Many of them said they liked the other title too. I decided to use both. The book is a Step Into Reading book from Random House titled Oh My, Pumpkin Pie, and the first line of the book is “Autumn in the pumpkin patch, no two pumpkins ever match!” It’s a book about the sizes, shapes and colors of pumpkins. They get it right away. We are all little pumpkins growing together in the pumpkin patch of life! IN: What advice do you offer for writers about the merits or pitfalls of taking writing classes, attending conferences and seminars, and the like? IN: When dealing with agents and publicists what suggestions and/or warnings can you pass along to burgeoning authors? CG: Concentrate on the writing. Test your work out on magazines you admire. If it catches on, keep going until you feel ready to offer a book-length manuscript to a publisher. If your book is original and well written it will be published. If your first few books sell well, you will have no trouble in finding a good agent. Like you, I love to write. I knew early on that whether or not my writing ever earned a penny, I would be writing for the rest of my life. The writing bug had bitten. The passion took over. It was then that my writing gained attention. It was then that I realized the possibility of providing for my family by doing the one thing I love the most. IN: Do you believe that children are becoming less or more literate with the mass infiltration of computers, the Internet, and technology in general into the public school systems? CG: Children are more aware of the world around them then ever before. I just hope they will continue finding ways to create some quiet time to think, to dream, to read, to imagine. Books make great companions in those quiet times. IN: Have you ever had problems with over zealous lovers of your work (children or adult)? CG: I welcome their enthusiasm! People drop by my house with books for me to sign all the time. I’ve yet to turn any of them away. Charles, David here. Tell us what you have in the hopper. CG: I have a new little SiR book coming out from Random House this September (BARN STORM) and four new poetry books (one about each season) coming out in 2011. The other two latest books are: SNOW WONDER (Random House, 2008) and SCORE! 50 Poems to Motivate and Inspire (Abrams, 2008). There’s a complete list of my books on the Bibliography page at FatherGoose.com, if you need it. Charles, thanks for being my guest today. I know that your many fans, old and new, have enjoyed your remarks and many may have comments for you. BULLETIN: I just posted my stone poem. I’ll have no groaning! Another week is flying by and another great guest is coming up in my Friday guest spot. Tomorrow I’m pleased to feature Charles Ghigna, also known to his fans as Father Goose. You’ll find out why that’s so tomorrow. For now, enjoy the following biographical information and get set to check back tomorrow. 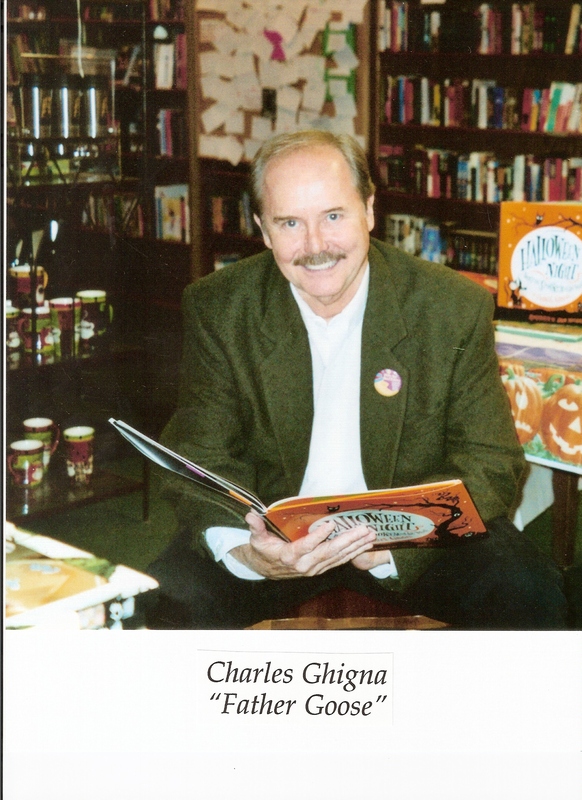 Charles Ghigna (Father Goose) is an award-winning poet, children’s author, speaker, and nationally syndicated feature writer who helps promote the love of poetry and children’s literature throughout the world. He is the author of more than 5,000 poems and 40 books from Random House, Harry N. Abrams, Inc., Knopf, Disney, Hyperion, Scholastic, Simon & Schuster, Running Press, Boyds Mills and other publishers. His books have been featured on ABC-TV’s “Good Morning America,” PBS and NPR, selected by the Book-of-the-Month Club and received the Parents’ Choice Book Award. His poems for children and adults have appeared in numerous textbooks and anthologies and in magazines ranging from Highlights, Ranger Rick and Cricket to Harper’s and The New Yorker. His poems also appear in the national SAT and ACT student testing materials. Charles has served as poetry editor of The English Journal for the National Council of Teachers of English and has presented his poetry programs at the Library of Congress, The John F. Kennedy Center for the Performing Arts, the American Library in Paris, the International Schools of South America and at hundreds of other schools, colleges, conferences, libraries, book fairs, and literary events throughout the U.S. and overseas. I want to thank everyone who visited my blog recently to read all the poems posted during the month and vote for your favorites. I know it takes time to pause in your day to support these writers who offer us the gift of their work. Please remember that the rich outpouring of poetry you read all sprang from a single word! Such is the power of our human experience that it allows us to see the same word in a multitude of ways and express our feelings with so many voices. During the course of this last round of voting, we were visited by readers in England, Australia, Germany, Scotland, Italy, and numerous states in the U.S. Word of the voting spread on Facebook, Twitter, and personal networking. For those of you who came here for the first time, welcome. I invite you to return to see what our poets will create using the new word for May, which is STONE. If you feel moved to try your own poem this month, I hope you will. Comments are always supportive and encouraging and each month we greet many new poets who share their first poetry here. If you know of others who might enjoy taking the Word of the Month Poetry Challenge, please let them know. We have poets from several countries who have discovered us and joined the fun. By having one division for adults and another for students, we can greet people of all ages. If you have questions or comments, please leave them below in the comments section. I am delighted to tell you that a fine poet and true gentelman will be my guest this coming Friday, May 7. His name is Charles Ghigna but his fans know him as Father Goose. On Thursday I’ll post his bio but for now you can easily find a great amount of information about Charles by surfing the Net. Now and then I invite you to suggest other guests you would like to see on my Friday spots. I hope you will continue to consider people you know or would like to learn about. I have several on the list of special guests who will appear in coming weeks but I’m always eager to add new names.